Looking for wholesale Bracelets and Anklets? 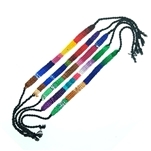 Rainbow Rider offers a large selection of wholesale bracelets and anklets at great prices. Nautical themes, rasta and reggae themes, festival themes,hippie themes, etc. THIN FLAT HORIZONTAL STRIPED FRIENDSHIP BRACELETS, RASTA COLORS. (1/4+"WIDE) THIN FLAT GLOSSY SURFACED FRIENDSHIP BRACELETS. (1/4+"WIDE) CHEVRON WEAVE BRAIDED FRIENDSHIP BRACELETS CHEVRON WEAVE BRAIDED FRIENDSHIP BRACELETS, RASTA COLORS.